Of course, L’Internationale first comes to mind and for good reason. 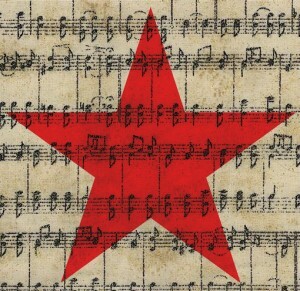 L’Internationale, with words written by French Revolutionary Eugène Pottier and set to music written by fellow Revolutionary Pierre De Geyter (who was from Flanders), has become one of the most widely recognized songs in the world, surpassing religious songs such as Amazing Grace and Silent Night and has been translated into more than 40 languages. It reminds us that the “International Soviet” (in other words the proletariat or the working class) will be the human race. Relive the glory of the USSR, with the exceptional National Anthem with words written by Soviet Sergey Mikhalkov (with help from Gabriel El-Registan) set to the great music of the Alexander Vasilyevich Alexandrov. Although the Soviet Union is gone, the anthem can still inspire us of the days of Lenin and Stalin, the dream of United Soviet Republics. But comrades, there are many more inspirational songs! I recommend the wonderful site, SovMusic.ru which has many workers’ songs. I hope you are inspired to continue our good work.